Risk appetite got boosted yesterday, a reaction reflecting investors’ relief after the US midterm elections. Overnight, the RBNZ stood pat, with Governor Orr keeping the prospect of a rate cut on the table. The central bank torch is now passed to the FOMC, which decides on policy later today. Expectations are for officials to remain on hold, but we expect them to keep the door wide open for a December hike. The dollar traded mixed against the other G10 currencies on Wednesday. 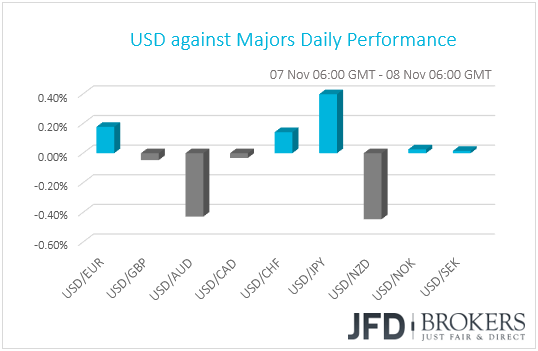 It gained against JPY, EUR and CHF in that order, while it underperformed against AUD and NZD. The dollar traded virtually unchanged against GBP, CAD, NOK and SEK.